My first theatrical experience at Edmonton’s International Fringe Theatre Festival occurred, appropriately, in a tent. The story concerned a clown by the name of Pagliacci. This was a full blown opera featuring all of Leoncavallo’s magnificent music but with a visually funky twist. Rather than a remote village in Calabria, the Mercury Opera presentation was set on Coney Island’s Boardwalk in Brooklyn, New York on Mermaid Parade Day. The costumes and characters had the audience chuckling which would not have been the case had this tragic opera been staged in its original form at the Met. Nor would tickets have been sold for $12. But a good time was had by all, the cast, receiving a standing ovation. I arrived in Edmonton, Alberta, Canada, just about dinnertime. The Hotel Metterra, where I stayed, was situated on the main street of Old Strathcona, a beautifully restored historic area just a few miles from downtown. The streets were bustling and people overflowing out of restaurants and bars. The atmosphere was wonderfully festive. I barely had time to look at my nearly 90-page program, so I went along with a new friend who had an extra ticket to the one and only operatic event of the festival. Following the opera, I wandered through the festival grounds, alive with excitement. I passed ethnic food stands of every description, stalls selling jewelry, clothing, handmade candles and an assortment of souvenirs. The beer gardens, filled with laughter and chatter, offered a welcome place to sit and relax. Fringing offers an opportunity to take a chance and experience the unknown. This non-juried extravaganza, with performances selected by lottery, offers an opportunity to witness sometimes bizarre, outrageous, funny, poignant and uncensored live theatre. Theater-goers never know where they are going to end up as part of the audience….a tent with bench seating, an outdoor stage, a proper air conditioned theatre or an aluminum structure with no ventilation. 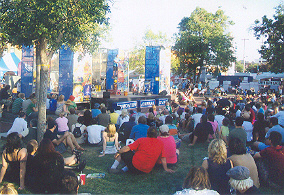 No cost al fresco performances both on the outdoor stages and informal staging areas drew standing room only crowds day and night. Indeed, some ticketed shows began as early as 11 AM with several continuing well past midnight. The variety included cabaret, children’s theatre, comedy, dance, drama, improv, multi-media, musical, comedy and more. The festival provides a home for developing new and emerging artists and audiences. From its grassroots beginnings as Chinook Touring theatre in 1980, this festival now ranks as the largest of its kind in North America. When I returned to my hotel room and perused the immense program I really had to concentrate on my scheduling for the upcoming days because a very strict on time schedule with no latecomers admitted is rigidly enforced. The program included nearly 300 different shows and over 1,200 performances which took place on varying days at varying times. Whew! I did manage to select a potpourri of entertainment which included comedy, drama, music and semi-mime. Next morning, I hurried to the ticket office, patiently waiting in line for my turn. As a fringer, one has to accept the idea of standing in lines a lot of the time. Amazingly, one of the most popular shows did not make it to the program but somehow word got around and it was a sell out. The Catalyst Theatre was one of those airless metal buildings with a no rise stage with a backdrop of black curtains. The only scenery for this show was a bench and a table. Multi-talented Julia Mackey wrote Jake’s Gift and convincingly played three characters, a 10 year old French girl, her 70 year old grandmother and an elderly Canadian war veteran. She flawlessly moved between characters and even seemed to change her appearance for each. The solo performance for the poignant story of Jake’s Gift elicited a standing ovation and bravas from the audience when her last word was uttered. Between shows, I paid a visit to the gigantic, colorful indoor Strathcona Farmers Market crowded with people shopping for all sorts of locally grown produce, poultry, meats, flowers and an abundance of crafts. Then I hurried on to the next venue. In the semi-pantomime physical comedy Why Do Fools Fall In Love?, adorable Christine Lesiak and rascally Adam Keefe kept the audience laughing with their uproarious antics. Though very few words were uttered, the actors’ sound effects added to the hilarity of their clowning around as two clowns in search of everlasting love. From Eyewitness Theatre in Manchester, England, three fine young actresses performed Euripedes’ Trojan Women on a bare stage. The play began with Andromache apparently holding a young child in a blanket and another woman, which the audience discovers a short time later is the mad Cassandra huddled beneath a blanket on the floor. The third actress icily enters as Helen of Troy. The three princesses are gathered beneath the wreckage of Troy awaiting their fate to become the slaves and whores of their Greek conquerors. Each woman thrashes out her fears and hopes for survival while awaiting their captors. The cast featured Nell Corrin, Laura Danielle Sharp and Carly Tarett. The title Crude Love rather put me off until I discovered it was a love story set in the oil fields. Authors/actors Gillian and Russell Bennett created an unlikely match between Phyllis McCormack, a woman dump truck driver from Newfoundland who falls in love with Abbie Waxman, a lone, ex-Greenpeace eco-warrior. The story is set in the year 2012 and takes place in Alberta’s Tar Sands when the US Military occupies northern Alberta. This well-acted, funny, poignant story offers a thoughtful political and environmental message. I wished I would have had more time to fringe because it was difficult to pick and choose and fit everything into my schedule that interested me. Rainer Hersch: All Classical Music Explained, Spiral Dive, A Body of Water and Maxim & Cosmo were just a few that I had hoped to see because I had heard lots of good talk about all of them. But there is always next year. Summer is primetime for Edmonton’s festivals with up to 17 hours of daylight for festival goers to enjoy. 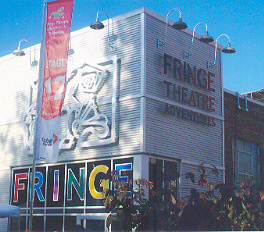 The 11 day International Fringe Festival, which takes place each year in Edmonton, Alberta, Canada, draws theatre lovers from near and far to experience new theatrical experiences and discover new talent. Air Canada: provided one of the easiest getaways I have experienced going out of LAX. I decided to print out my boarding passes in advance, but when I encountered some difficulty I called their help line which was answered immediately. I was talked through the problem and printed my boarding passes. Having only carry on luggage made it a breeze not having to stand in any lines other than for security. Packing light and printing early made for an easy departure. Metterra Hotel on Whyte: boasts a perfect location for the festival with clean, comfortable, attractively decorated rooms, complimentary breakfast and business center.